It’s easy to forget that Columbus Day is more than just a day off from work (which we’re not complaining about), but rather a holiday celebrating Christopher Columbus’ arrival in the Americas on October 12, 1942. 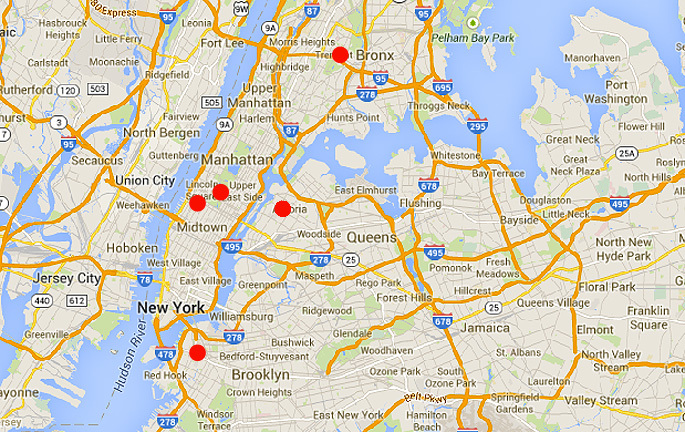 But if you need reminding, look no further than these memorials scattered around New York City. 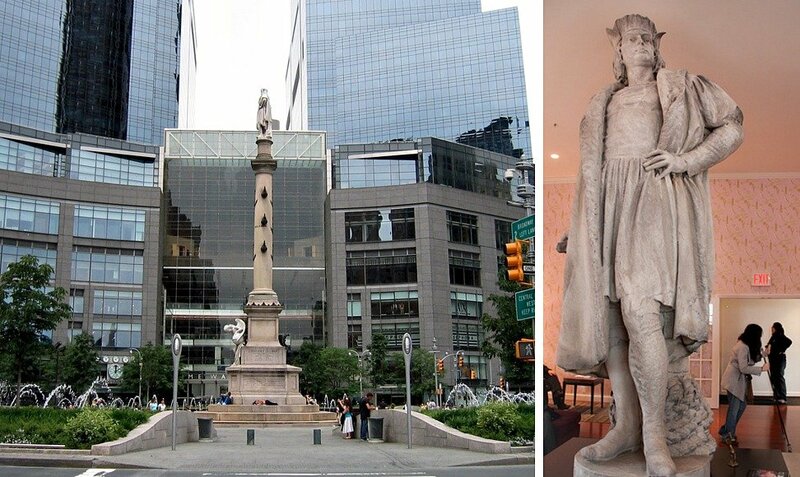 Probably the most well-known ode to the explorer is the Manhattan crossroads known as Columbus Circle. Completed in 1905 to the design of William P. Eno, Columbus Circle was part of Frederick Law Olmstead‘s grand vision for Central Park. The monument at the center of the circle, however, predates the traffic circle’s unveiling; it was erected in 1892 to commemorate the 400th anniversary of Columbus’ discovery of America with funds from an Italian-American newspaper. It was created by Gaetano Russo and is crowned by a marble statue of Columbus atop a 70-foot granite column adorned with bronze depictions of the explorer’s three ships. Columbus is looking outward with his hand on his ship. At its base is an angel holding a globe. 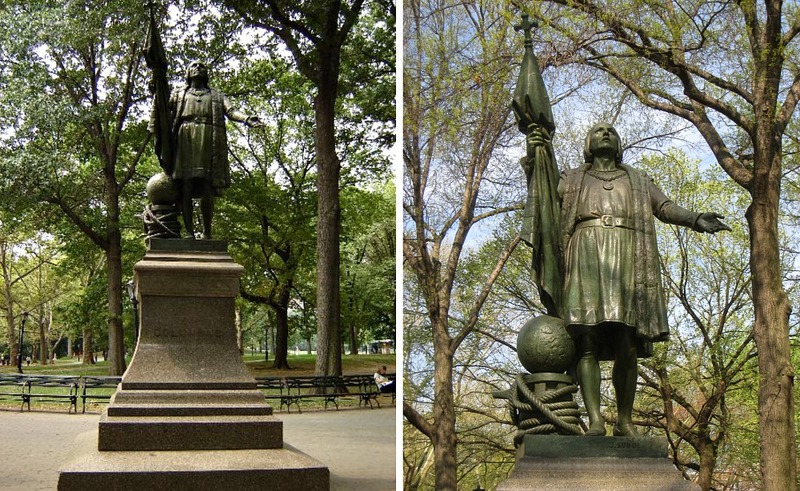 In addition to the Columbus Circle statue, another memorial to Columbus was erected on the 400th anniversary of his coming to America, this time in Central Park at the southern end of the mall at 66th Street. The work of Spanish sculptor Jeronimo Sunol, the bronze sculpture was unveiled in 1894. Here, Columbus is portrayed more spiritually with his arms outstretched and eyes looking up to heaven, thankful for the successful voyage. Columbus Park (formerly Mulberry Bend Park) is located in Chinatown and was named after Christopher Columbus in 1911. Its sculptural homage to its namesake represents the navigator on the deck of a ship just before land came into view. Sculptor Emma Stebbins, best known for creating the bronze statue Angel of the Waters at the center of Central Park’s Bethesda Fountain, carved the large marble sculpture of Columbus in the late 1860’s. It was intended for Central Park originally, but was never erected. In 1934, it was discovered in storage, and the Park’s architect at the time, Aymar Embury II, designed a new limestone base for it, and it was installed that year in Columbus Park. It was moved again in 1971, and now sits in front of the New York State Supreme Court Building. Columbus Square is a tiny, triangular plot of land in Astoria, Queens, acquired by the city in 1910. 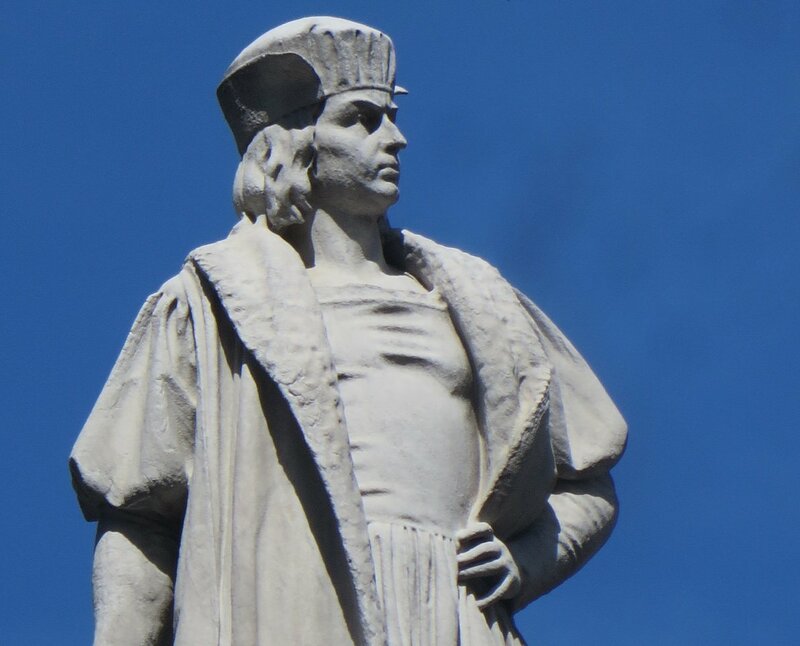 Local Italian-Americans have gathered at the spot to celebrate Christopher Columbus since the 1920’s, and in 1930 it was officially named for the explorer. 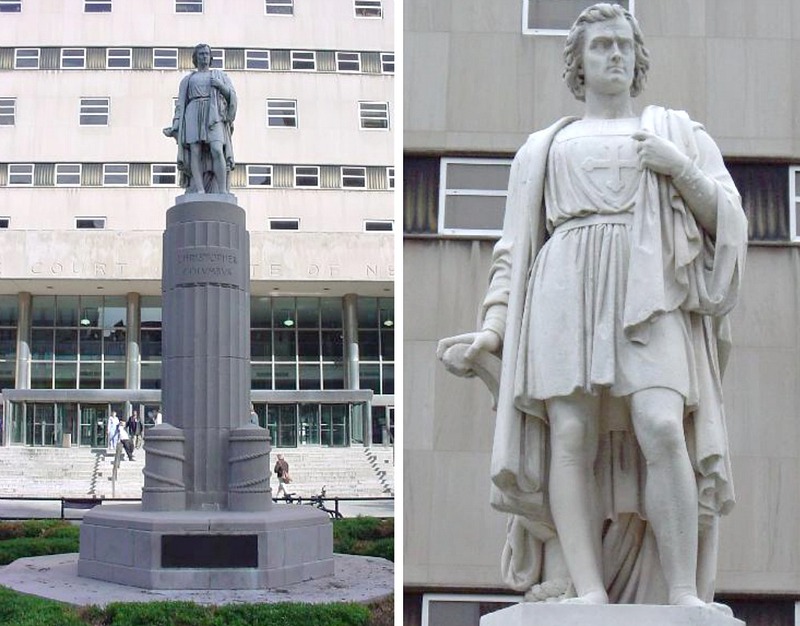 In 1938, with WPA funds, Italian sculptor Angelo Racioppi created the seven-foot-tall bronze statue of Columbus standing in front of a ship’s tiller. 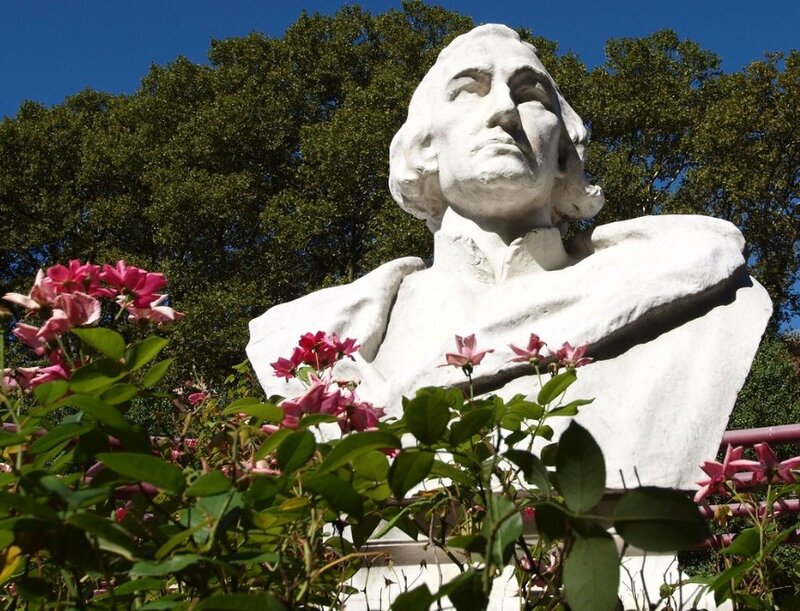 In an odd twist, the sculpture became a source of contention for Robert Moses, as he felt it didn’t resemble the Columbus depicted in history books. 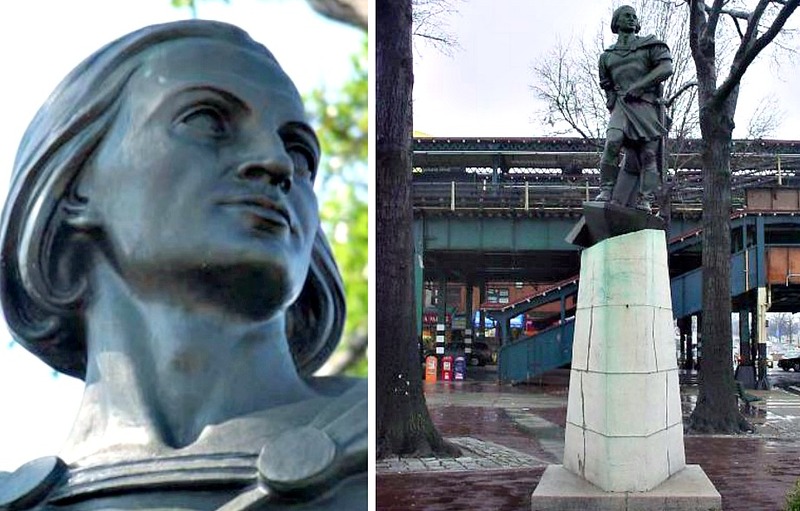 Fittingly located in the Bronx’s Little Italy, D’Auria-Murphy Triangle is another wedge-shaped piece of land with a Columbus monument. Italian-American sculptor Attilio Piccirilli created the work in 1926. It is a Carrara marble bust on a granite pedestal.